Student-athletes helped serve game day fare of hamburgers and hot dogs to more than 6,000 students at the Dunlap Champions Club Monday evening. As the worst of Hurricane Irma moved past Tallahassee Monday afternoon, some of the very best qualities of the Florida State University family were on display at a swiftly organized post-hurricane dinner at Doak Campbell Stadium. 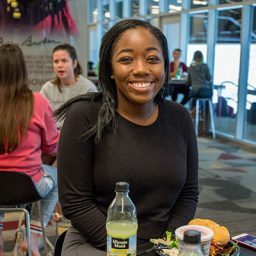 Even as the storm shut down campus this week, FSU organized a plan to open the 70,000-square-foot Dunlap Champions Club — the premier club-seating venue in the stadium — to feed thousands of hungry and grateful students who could finally breathe a sigh of relief. 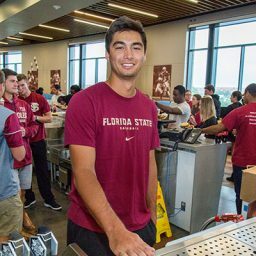 Freshman Laura Palomino was all smiles as she waited in line for a hot dinner served up by Florida State athletes, who volunteered to work the event. 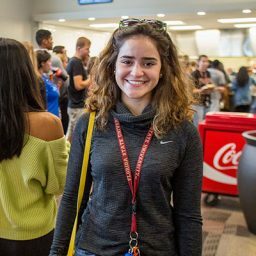 Palomino thought the university did a great job keeping students informed and helping them cope with extra stress in the days leading up to the hurricane. Junior Cobi Johnson, a pitcher on the baseball team, was one of the athletes helping out at the Champions Club dinner. 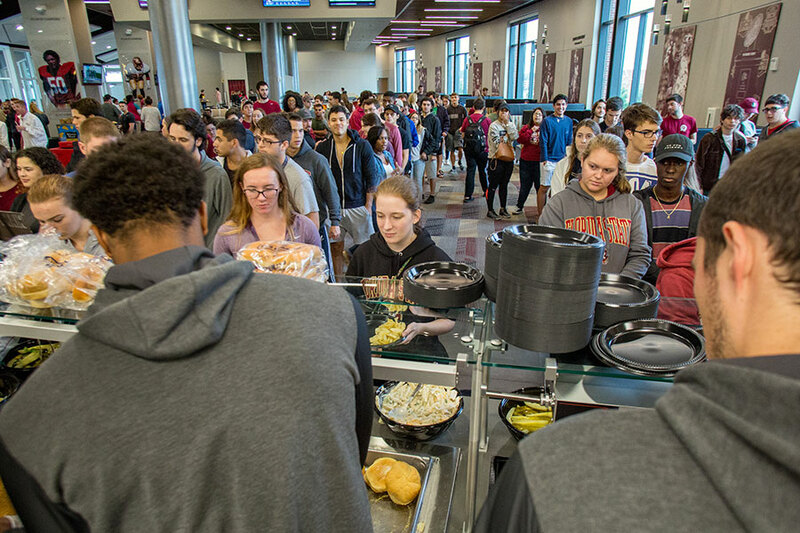 Florida State’s food-service provider Sodexo worked hard to prepare thousands of extra meals for students over the weekend. Sodexo and Seminole Dining made 11,400 box meals to deliver to students in residence halls on Saturday and Sunday. Then, they managed to assemble the big dinner at the Champions Club with just a few hours to pull it off. They served game day fare of hamburgers and hot dogs to more than 6,000 people Monday evening. The mood in the Champions Club was upbeat as some students sprawled out in booths with cushioned seats, while others stepped outside and grabbed the premium seats on the south end of the stadium. Latouche also appreciated the planning that went into the lead-up to the storm at her residence hall. Now, Thrasher said, it’s time to start focusing on helping the Florida State family get back to its normal routine with classes resuming on Sept. 18. 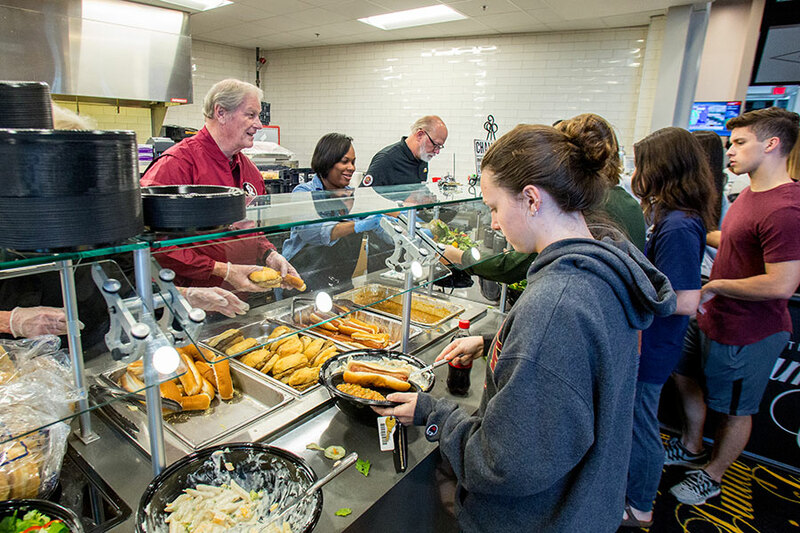 President Thrasher serves meals to grateful students following Hurricane Irma.